Lock in a great price for Bluesun Hotel Elaphusa – rated 8.8 by recent guests! This hotel offers everything you could possibly expect from a luxury hotel. Night club, Swimming pools , Spa, Bowling. 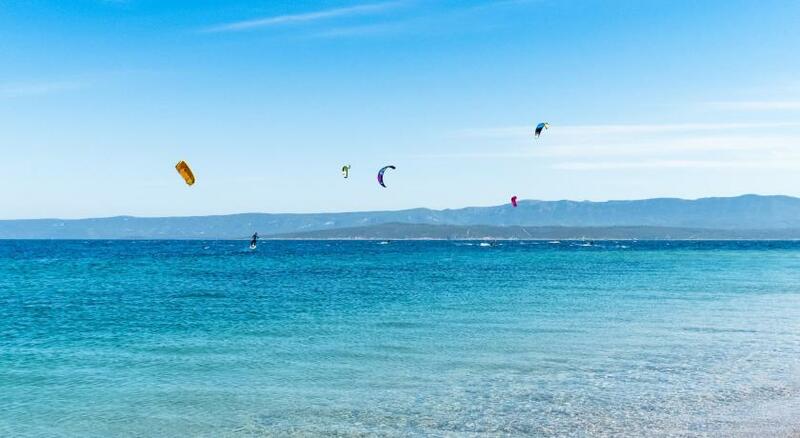 Short walk to famous Zlatni Rat Beach, one of the best location. Breakfast was excellent. We thoroughly enjoyed our stay at this hotel and we will be back. Amazing property! Spa and pools were perfect. Staff was friendly. Lots to do on site ! Walking distance to beach!! The size of the rooms, the variety of the breakfast, the superb attention to detail of the staff and hue helpful everyone was in the fro t desk, dinning room, bar, and spa! Breakfast and dinner buffets were prepared with attention and care - the food was delicious. We had booked the half-board (they apparently also have full board and all-inclusive options! ), our breakfast and dinner buffets were included. The food was excellent at every meal. There were always healthy options, lots of salad and fruit and vegetables. It was a great deal for May day holiday. We stayed for three nights. Had breakfast and dinner included. Food was delicious and various. Rooms are clean. Staff is really polite. Good beds. Great location. Nice small village near by. Beachfront location and lovely view. Great spa & swimming pools. Good selection of food. Good location for Zlatni Rat and the main harbour. Bluesun Hotel Elaphusa This rating is a reflection of how the property compares to the industry standard when it comes to price, facilities and services available. It's based on a self-evaluation by the property. Use this rating to help choose your stay! One of our top picks in Bol.Boasting the largest wellness and fitness center on the Brač Island, a tennis center with 26 clay courts and a bowling alley, Bluesun Hotel Elaphusa is located 150 feet from the sea and a short walk from the popular Zlatni Rat Beach and the center of Bol. Water world offers an indoor and outdoor pool, a paddling pool for kids and sunbathing area. It also includes a tepidarium with heated water, ceramic beds and a cocktail bar. Free children animation is organized. Elegantly decorated and spacious rooms consist of air conditioning, a king-size bed and a bathroom with a bathtub and hairdryer. Amenities include a mini-bar, LCD TV with satellite channels, telephone and safety box. For breakfast and dinner guests can choose from a large buffet, relaxing at a bar with a charming terrace. An à la carte restaurant Valium Tavern offers local and international specialties. For night entertainment there is a Night Club Ella. Various saunas, hydromassage hot tubs and 12 beauty treatment rooms are provided at the Thalasso Wellness Center. Elaphusa Hotel houses 5 conference halls and meeting rooms fitted with first-class technological equipment. Transfer service and various excursions around the region can be arranged at the hotel at an additional cost. This is our guests' favorite part of Bol, according to independent reviews. When would you like to stay at Bluesun Hotel Elaphusa? This air-conditioned room features a king bed and a bathroom with a bathtub and hairdryer. The room comes equipped with a minibar, LCD TV with satellite channels, telephone and safe. These are newly furnished, spacious rooms featuring a pull-out chair or a sofa bed, as well as a bathroom with bathtub and hairdryer. LCD satellite TV, minibar, telephone and safe are included. On the sea side of the hotel, these newly furnished, spacious rooms come with a balcony, a king bed and a pull-out chair or sofa bed, as well as a bathroom with bathtub and hairdryer. LCD satellite TV, minibar, telephone and safe are included. Set on the sea side of the hotel, this room includes a balcony, king bed and a bathroom with bathtub and hairdryer. LCD satellite TV, minibar, telephone and safe are standard equipment. Featuring a balcony with views of the sea, these newly furnished and spacious rooms come with a twin bed and a pull-out chair or sofa bed, as well as a bathroom with bathtub and hairdryer. LCD satellite TV, mini-bar, telephone and safety box are standard equipment. Featuring a balcony on the sea side of the hotel and a spa tub in the bathroom, the elegant Junior Suite includes a king bed and a living area with 2 armchairs, a 3-seat sofa and a table with 4 chairs. LCD satellite TV, minibar, telephone, hairdryer and safe are standard equipment. Ideal location by the beach, superb room amenities and great food are just some of the reasons you'll enjoy staying at the Elaphusa Hotel. We recommend you to check the excursions offered at our tour desk - discover Brač island and Dalmatia and make the most of your holiday. The Elaphusa is part of Bluesun Hotels & Resorts, a company that includes 15 hotels, campgrounds and resorts all over Croatia. More than 150,000 international guests per year choose Bluesun hotels for their vacations. House Rules Bluesun Hotel Elaphusa takes special requests – add in the next step! Bluesun Hotel Elaphusa accepts these cards and reserves the right to temporarily hold an amount prior to arrival. Please note that the amount of available extra beds and rates vary due to room type. Air conditioning doesn’t get switched on in April so the room was too warm to sleep comfortably. The only thing that could’ve made our stay better would be close availability of convenience items. The only supermarket or pharmacy was in town (only about 1km away) but as we stayed over Easter weekend we were unable to buy basic necessities and medications. It just meant we weren’t fully comfortable and really had to make-do with the medications we already had. The only other bad point was that the whole property runs off a centralised air system which was set to heating (in spring) and rooms couldn’t be individually controlled. Made for some hot sleeping conditions on days that were in the mid 20’s (degrees Celsius). Amazing value for money. Staff are kind and friendly and facilities are clean and up to date. You can choose to include breakfast and dinner; or breakfast, lunch and dinner in total cost and your accommodation include access to the gym and pools. Having the spa on site was amazing too - we enjoyed massages and access to the saunas; also great value for money. The ‘do not disturb’ signs kept falling off the door during the night/morning so the cleaners woke us up at 8am 4 mornings in a row. For me this was too early to knock on doors. The staff were very friendly and approachable. I didn’t feel like the hotel was missing anything. The spa is fantastic! Walls are a bit thin. Clean. Good water pressure in the showers. Comfy beds. Good staff. Very nice surroundings, Bol is beautiful and has beaches with crystal clear waters. The outside pool was nice but requires some maintenance. The furniture is good, but not from this time. The food was amazing! So many different options and delicious! the location was perfect, 5-10 min walk to Zlatni Rat beach and 10-15 min to the harbor. The personnel of the hotel was always very helpful and kind. would recommend going there! Espresso drinks were not included in the buffets. Hotel is roughly 7 minutes walk from Zlatni Rat. These are small things: I don't want a mini bar, (I want a fridge to keep water cold in). There was no kettle (means no cup of tea in bed). Shower over bath - (slidey underfoot and water splashes out under the silly screen thing). Lots of people complain about the French TUI animations... and yes, they were dreadful and annoying. If your holiday is about staying on site, by the pool, or on your balcony and you don't want to hear French teenagers shouting waterobics instructions through a PA - look elsewhere. Bluesun - you need to decide your priorities here. We went offsite so it was not really an issue. That said, one reason I chose this over the Zlatni Rat, was it had a pool... that I actually never swam in because when I wanted to, it was all "Allez allez... soulevez vos jambs" at high volume. Ok.. and the cleaners could be a tad quieter of a morning!.. and who is it that drags chairs in the small hours? Should have better food selection for breakfast and dinner as a 4 Star rated hotel. Nice hotel in Bol, very close to Zlatni Rat Beach. Overall pleasant stay. Not truly 4 star due to limited food selection. Nice Spa and wellness facilities. We don’t have any negative comments to add. Our stay was very pleasant and beyond all expectations. Nevertheless we stayed only for to nights, the room was ready at 11 am (way before official check in) and on the last day they even allowed us to leave the car parked for whole day.